Last March, IHG – owners of the InterContinental, Crowne Plaza, Holiday Inn etc brands – acquired 51% of Regent Hotels & Resorts for $39m, ie peanuts. For comparison, the refurbishment of InterContinental Park Lane a few years ago cost three times that. ….. and the Singapore property, managed by Four Seasons, is leaving the chain with Capella taking over management. Whilst IHG has big plans, including rebranding the InterContinental in Hong Kong, they will take time. The good news is that the five remaining Regent properties are now available for booking on ihg.com. The best one is probably Berlin, but this was a Four Seasons until a few years ago so it clearly has a great hard product. The bad news is that points redemptions are not yet available. You WILL earn points from a cash stay. Hopefully we can see redemptions available before the Summer season comes along. The Regent Berlin booking page is here. 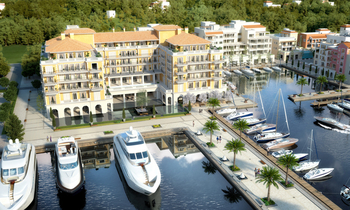 The Regent Porto Montenegro booking page is here. Malaysia Airlines is running a special promotion with Visa this weekend. You can save an additional 5% on all tickets in both Economy and Business as long as you travel by 6th May. You can ONLY get the discount if you book via this page of the Malaysia Airlines website. The offer will be running every weekend until the end of March, but this weekend it coincides with – and doubles up with – the January sale savings. As well as Kuala Lumpur, Malaysia Airlines has good connections to Australia and elsewhere in Asia. Malaysia Airlines has recently taken delivery of new A350-900 aircraft and is now operating them on the Heathrow to Kuala Lumpur route. There are two daily departures from Terminal 4 at 10.25 and 21.25. Full details of the new planes are on their website here. 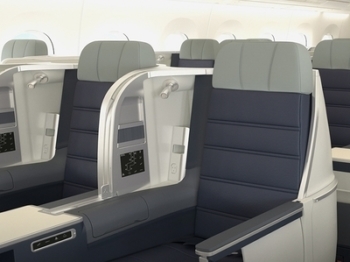 The Business Class layout looks pretty good. It is a staggered 1-2-1 or 1-2-2 layout, similar to Aer Lingus. It even has two Aer Lingus-style ‘throne’ seats on the right-hand side. On the left, one row has ‘table / seat’, the one behind ‘seat / table’ and so on, so that your feet slot under the table area of the seat in front. The Qatar Qsuite works in a similar way. Vueling, BA’s low cost sister airline, is launching a new Gatwick to Alicante service on 7th April. The service will operate six days per week. The flight departs at the slightly odd time of 9pm, Friday to Wednesday. This may be part of the expansion driven by the purchase of Flybe’s Gatwick slots, with Flybe’s Newquay service moving to Heathrow on 31st March. Vueling Club has its own Avios programme which is operated via avios.com. If you open a Vueling Club account you will earn 3 Avios per €1 spent on the cheapest tickets, rising to 4 per €1 for more flexible tickets. You can redeem Avios for Vueling flights via Vueling Club too, but it is purely revenue based and the ‘pence per point’ value is poor. Confusingly, you can also book Vueling flights with Avios via Iberia Plus. This uses the usual Avios redemption chart with standardised seat pricing. Fly CW LAX-LHR in feb courtesy of a 241 and some churns. As a blue who can’t select seats early, what should I am for given I’m travelling with my partner? OT and help please! My flight to Kharkiv, Ukraine with wizzair scheduled 19 feb got cancelled and wizzair offered to re-route me to Romania (!). Can i force them to re-route me to Kiev, from where I can easily get to Kharkiv, with different airline as, I have no business in Romania?? Thx all! Yes you have the absolute right to re-routing by comparable means, it’s enshrined in EU law, google it. OT – I know some has answered before but the can not recall the answer. If doing a payment to HMRC for self assessment using curve linked to virgin, is virgin adding and fees? Not as of my last statement which was 17th Jan! Exactly. HMRC is not a financial institution. Has anyone received this offer i.e. who were not targeted last month but offer may have appeared again, if the enough sign up has not been taken up? Trying to see if anyone received this offer in last couple of weeks. OT- To qualify for VS SIlver do I need 400 Tier Points only? Ref the Malaysia Air deal – does anyone know when the discount appears – automatically via the link or when you click through to add your Visa number? Has anyone else’s MR stopped showing in their account and brings up an error when trying to login into the MR catalogue? OT_ Has anyone got any experience of buying airline status off eBay? There are seller on eBay posting airline status for a fee. Not necessarily: GGL give away cards. There was an article on this on LL one or two days ago. Yeah I think that was a specific website? Either route sounds dodgy and potentially runs the risk of your account being closed. Personally I wouldn’t do it if you had a reasonable balance! Personally I wouldn’t be tempted because I never bother with status as I almost always book business or sometimes First with cash or miles. Only BA bronze, only think I miss is inability to choose seat free at time of booking. However, even that is not all that important in my own experience. Even over the busy Christmas and New Year period my partner still managed to get seats 4A and 3K for free. I read maybe the same. Some club you sign up £99 via their app and it’s in beta. So here’s an idea, someone needs to develop a Hotels.com for the airline industry. Fly with any brand and build up loyalty with them. That way you are not stuck with a certain airline. I think the credit cards are doing that. The Daily Mail used to run a Club that sounded like it might do something similar and I think some travel agents like Trailfinders might have the odd scheme that worked a bit like that in the far far past. Given that OTAs get around 1% commission on a flight booking I doubt that will happen. OT – we are planning a stay at a German hotel (Traube Tonbach) which annoyingly does not accept credit cards. According to their reservations team they only accept EC-Cash or cash at check out. That’s a lot of cash to carry around for a 5 night stay. Although on tripadvisor looks like some people have managed to pay by bank transfer. Short of hoping they change their card policy between now and July, does anyone have any suggestions for ways to pay the hotel not using cash? Looks like EC cash cards are too difficult to get. Also looked at the Avios Cash Passport MC but not sure about that either, or even if they’d accept it. You could probably load up a Revolut card from your credit card (which most credit cards treat as purchases, earning points) and then send the money to their bank account from your Revolut card. German hotels are a bit odd. I booked one last night for my parents in law, a fairly big German chain. There are no pre-pay rates at all. You can only book ‘pay at hotel’ which is obviously risk free for the guest (you don’t even need to give a credit card unless you plan to arrive after 6pm) but very 1999! Ah..yes very odd! Do they not really use credit cards in Germany? With Revolut can you load it with Amex? Thanks Rob. They do use credit cards but not commonly – memories of the 1930s are still alive and well and spending more than you earn each month has the sort of social stigma that Brits tend to reserve for convicted child molesters. EC bank cards are taken. Amazon works by bank transfer – you order something and they sit on it until you’ve transferred the cash across! You can’t load Revolut from Amex. No you can only load Revolut from Mastercard or VISA.